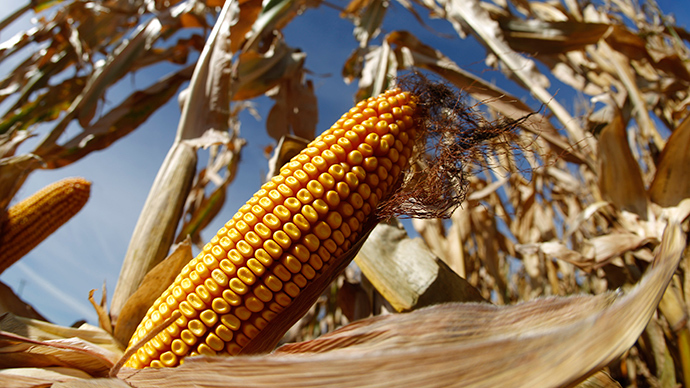 The United States is the largest producer and consumer of corn, which is virtually inseparable from the American diet. Corn is in sodas and potato chips, in hamburgers and French fries, in sauces and salad dressings, in virtually all poultry and even most fish, the book states. The findings come from a new book, called “The Story of Corn,” in which author Betty Fussell chronicles the grain’s several-thousand year history. While less than 10 percent of the grain is consumed directly in the form of sweet corn or ‘corn on the cob,’ the bulk is turned into ethanol for fuel or fed to hundreds of millions of animals. Cows, chickens, pigs and even fish are fed pellets made largely of corn, with the animals eating several times the amount of grain consumed by people each year. “It’s in almost every product in the supermarket today,” Fussell told the Washington Post. “That’s no exaggeration." While the corn plant is ubiquitous in the American diet, the same strains are not being consumed by humans and animals. Fussell said sweet corn, the silk-laden, buttery-yellow grain waving in the field, accounts for only 1 percent of the corn grown in the US. Flint corn, familiar to many as popcorn, is another source of direct consumption, but it is also processed to make high-fructose corn syrup, a commercial sweetener which finds its way into most of the beverages consumed in the US today. Dent corn or field corn, the variety of corn that is fed to animals that are slaughtered for food, accounts for the majority of America’s corn production. Fussell said corn’s ascent as the backbone of the American diet resulted from the grain being highly adaptable, easily manipulated and inexpensive. The invention of canneries, railroads and the iron plow during the industrial revolution contributed to an explosion in corn production. In addition, hybrid strains invented by scientists created larger ears of corn and allowed them to be grown closer together, creating bumper crops. The introduction of new industrial fertilizers spurred a further growth spurt, she said. “Our entire diet has been colonized by this one plant,” Michael Pollan, author of “The Omnivore’s Dilemma,” told National Public Radio in 2003.